Raw desserts are not only healthier, they're easier to make! No baked-on messes, no hot pans to let cool, no "fallen-in" cakes, etc. This easy recipe is fun and decadent! This is a fabulous dish to bring to an Easter celebration. 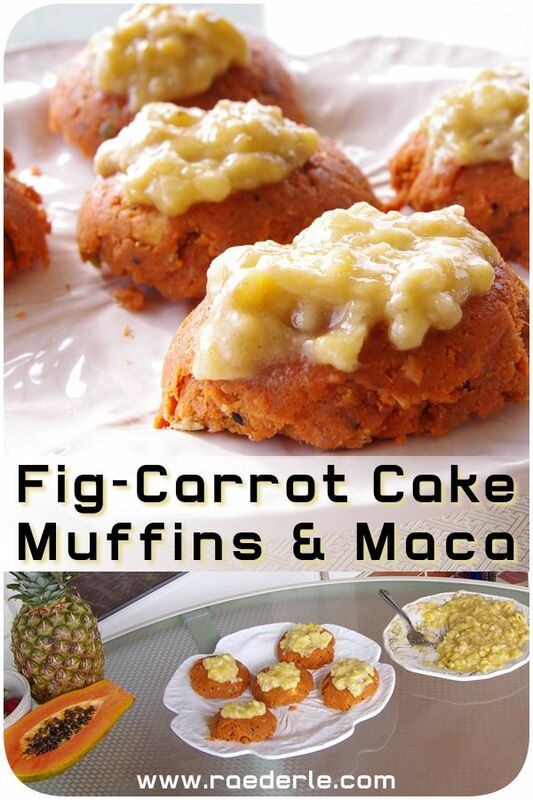 Using muffin-shape it is much more party-friendly and even skeptical folks who wonder about your "crazy diet" will not want to pass-up your colorful presentation. 1. Blend carrot pulp, dates, cinnamon, ginger, turmeric, nutmeg, sea salt and one lemon's juice, until a smooth nearly-consistent texture is formed in your food processor. This will take thirty seconds to a minute, depending on your machine. 2. Add figs and pulse 8 to 14 times. Add walnuts, and raisins (and/or dried mulberries ) to your food processor and pulse to combine. Walnuts should be chopped slightly, but still in chunks. Pumpkin seeds, hemp seeds, flax seeds, etc, may also be added for more colors, textures and nutritional diversity. 4. Peel bananas and put them on a plate. Mash bananas with a fork. Add maca powder and then continue to mash until the consistency desired is achieved. 5. Pull muffins out of the fridge and coat them with frosting. Serve and enjoy! Continue reading for nutritional information (shown below). The nutritional information is based on eating one quarter (one fourth) of the total ingredients listed above, including the frosting ingredients. Like this recipe? Sign up for my monthly newsletter below. It is my pleasure to bring you this ad-free, completely authentic and original website. This entire site is a one-woman operation. I, Raederle, do the HTML coding, the writing, the photography, the artwork and more. Then you come along, view my work and make it all worth while. Except that sometimes your viewership isn't enough. Sometimes a gal has got to get paid. So now I've set it up so that you can contribute a small monthly sum (as little as $1 a month) in exchange for getting exclusive, exciting, bonus content from me. Patrons give me something priceless for a small price-tag: appreciation. Ever heard of the five love languages? It took me a while to realize this, but there is a different form of "gifts" as a love language, and it is called financial support. That's right – it makes me feel loved. I hope that isn't too much honesty for you, because my patrons read more personal admissions from me than that! Visit my patreon page and become a patron to immediately access to my personal revelations, coloring book pages, never-before-seen photography, inspired recipes, insider polls, and more.